From December 1936 to February 1937 members of the United Auto Workers organized a sit-down strike inside the General Motors Fisher Body 1 and 2 plants in Flint, Michigan. They ultimately won recognition of their union and improved wages and conditions. 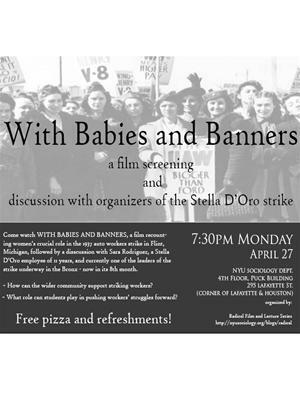 "With Babies and Banners" tells the story of the Women's Emergency Brigade, composed of female GM workers and the wives of men involved in the sit-down strike, which not only provided support services (like running the union kitchens that provided food to the strikers occupying the plants) but did picket duty themselves. It intercuts footage from 1937 with interviews with the same women 40 years later, still active in union politics and still pressuring the UAW to acknowledge women as equals.